Sri Krishna Pharmaceuticals Limited is an established manufacturer of pharmaceutical products such as paracetamol, folic acid, domperidone and furosemide, supplying more than 150 niche drugs to the Asian pharmaceutical market, plus Europe and the USA. Established in 1974, Sri Krishna Pharma has five fully-equipped GMP manufacturing facilities in India. The organization is also the only company in the world to have a USFDA-certified facility for the manufacturing of folic acid. When expanding production at one of their facilities, the company sought a high-quality pharmaceutical screening solution. Having purchased Russell Finex machinery previously, Sri Krishna Pharma once again relied on the company to provide a solution. Production at its Uppal factory was being upscaled to include the manufacture of paracetamol. 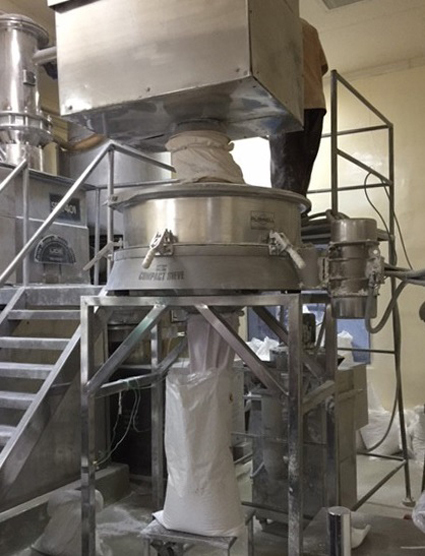 During its manufacture, a homogeneous product is made by blending various pharmaceutical powders to provide the perfect uniform mixture. The product must then be screened before it is packaged, to ensure foreign or oversize contamination is removed. Deblinding System ensures these powders can be screened on finer meshes without compromising flow rates. With more than 80 years’ experience supplying aseptic pharmaceutical screening solutions to global customers including Pfizer, GSK, Wyeth and Sanofi-Aventis, Russell Finex analysed Sri Krishna Pharma’s unique requirements and supplied three 900mm diameter Russell Compact Sieve® units with Vibrasonic® Deblinding System. The Russell Compact Sieve® is a high-capacity pharma screener, capable of achieving higher throughput rates compared to conventional machines. The enclosed system is ideal for the pharmaceutical industry as it provides total containment, protecting operators from any harmful dusts or fumes. High-quality stainless-steel contact parts enable easy cleaning – these aseptic pharma screeners can be easily dismantled and assembled without the need for tools. Due to the nature of API’s, mesh blinding can often be experienced when screening these pharmaceutical powders. Fitting the Russell Compact Sieve® with the Vibrasonic ® Deblinding System ensures these powders can be screened on finer meshes without compromising flow rates. This powerful mesh deblinding technology applies an ultrasonic frequency to the mesh, breaking the surface tension to prevent the fine particles from blinding or blocking the mesh screen. This not only results in consistent product quality and increased production rates, but also prevents the loss of good product and damage to the mesh, and further reduces downtime to clean the mesh. Established in 1934, Russell Finex has a wealth of experience in supplying pharmaceutical manufacturers with customized and hygienic pharmaceutical separation solutions. A range of vibratory sieves, separators and self-cleaning filters improve product quality, increase productivity, safeguard operators and ensure contamination-free powders and liquids. For more information, contact Russell Finex today.